Another interesting, relatively fast heavy weather boat with an added feature, a man-overboard scoop, built for a Canadian pilot organization. Plus it is built of composites. 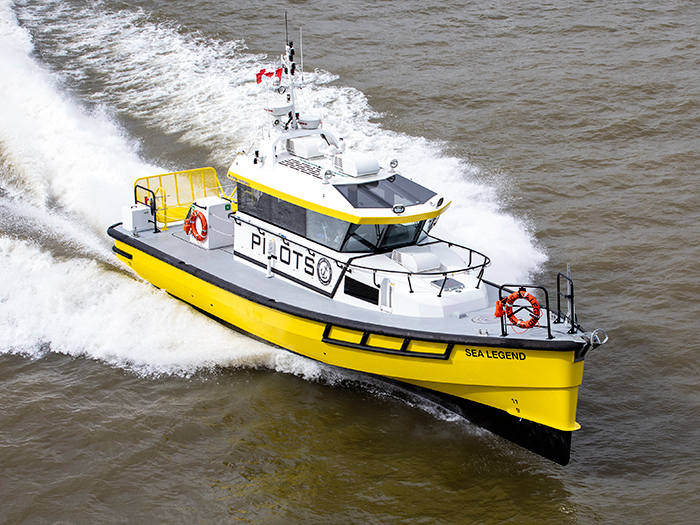 After being built at Damen’s specialist in composite construction, Damen Shipyards Antalya, Turkey, the Stan Pilot 1605 FRP was outfitted at Damen Shipyards Gorinchem, the Netherlands, where Transport Canada was able to inspect the vessel. According to Damen’s naming convention, the boat has a length of approximately 16 meters (52.5′) and a beam of approximately five meters (16.5′). The man-overboard recovery system has got to be of interest to a SAR organization. The scoop is a sophisticated piece of kit that retrieves people from the water and can be used even when the person has lost consciousness. The control for this function is located at the stern, from where the vessel can also be controlled during an emergency. This reminded me of an earlier post that featured a man in the water recovery system.